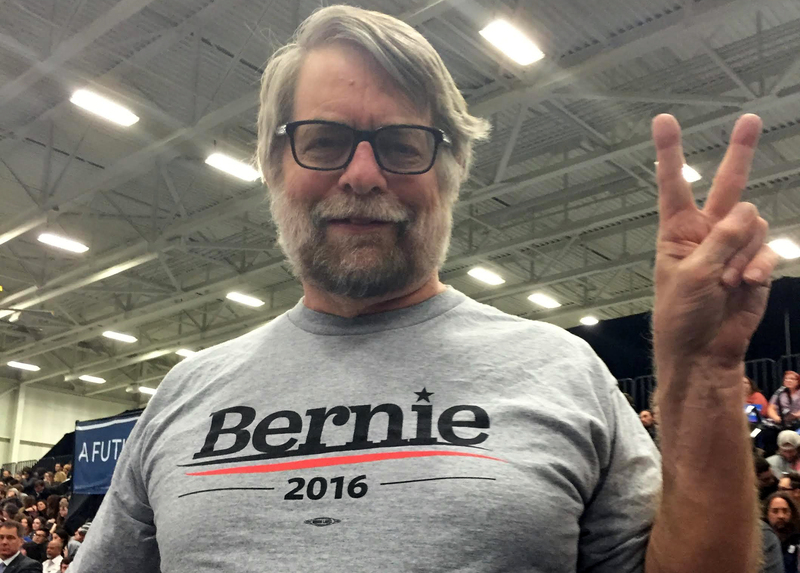 Michael Betzold at a Bernie Sanders rally. While calling Bernie Sanders supporters Tuesday, I reached a Detroit woman who was driving down the freeway. “I’m reminding you to vote today,” I said. Few but the most ardent in the Bernie army saw his stunning upset in Michigan coming. I know I didn’t. In fact, in a few brief stints volunteering at his Detroit headquarters in the last couple weeks, I wasn’t at all impressed by the campaign’s organization. Too often they had no task for volunteers except making inconsequential phone appeals to a supporter list that seemed rife with wrong numbers and bad info. When I left the office at mid-afternoon on Election Day, there were still dozens of canvassing packets remaining on the table with no apparent urgency to find volunteers to go door-to-door and try to use the info in those packets to ferret out voters. Placards sat on tables with no concern about getting them out the door. The reminder calls I was making seemed many hours behind. I’d seen the polls that had Hillary with a double-digit lead. To keep myself from the emotional plunge I usually experience after an election, I decided I’d be happy if my candidate cut it into single digits. And nothing I saw anywhere made me feel more optimistic. I desperately wanted to believe, of course. I’d seen all the enthusiasm firsthand at the Bernie rally at Macomb Community College Saturday night – held at the same time Hillary Clinton was speaking to party bigwigs at MGM Grand in downtown Detroit. Never in my lifetime did I imagine I would see thousands of people cheering a socialist candidate for president in the heart of Warren – just a few miles from the very parochial, very politically backwards, very racist suburb where I’d grown up in the 1950s and 1960s. I’d spent months posting my own impassioned arguments on Facebook, battling with friends who kept insisting Hillary was inevitable and necessary to stave off a Republican win in November. They accused me of arguing that Sanders was a better candidate just because I had a personal deep dislike for the shape-shifting, mendacious Hillary – and they were probably right. Yes, I could cite polls that showed Bernie did better than Hillary at beating Donald Trump. But some progressive friends kept insisting they knew better and that voting for someone you actually believed in must be wrong – because for so many, many years it has been futile. You see, too many in my generation and political cohort – the radicals of the Sixties – have been beaten down into submission by so many heartbreaking defeats that many of us have learned to settle for the likes of anyone who’s not a troglodyte. Now we’re facing a real troglodyte, and fear trumps reason. I’d volunteered to drive people to the polls, but the Sanders operation found me exactly one man in Hamtramck to take to cast his vote. Since I didn’t know if anything I’d written online had persuaded one single person, I felt my tangible total contribution to the cause was two votes – mine and that man’s. I felt pretty useless. You see, I’ve had a long history of fighting losing battles. But on Tuesday, I was in uncharted territory – on the winning side. And my arguments have new weight. So what that Hillary has cleaned up in the South? No Democrat will win any of those states in November. No, independents will decide the election – many of them responding to Trump on economic grounds – and Sanders trounced Clinton among those independents here by a 72-to-27 margin, according to CNN. So Sanders can vanquish the Donald on the most important turf. I’m not just grasping at straws, folks. This is a deadly serious matter. Now, for probably the first time in my political life, I can gloat. That damned super-nerd Nate Silver, who predicted Bernie had a 1 percent chance of taking Michigan, was wrong despite all his sophisticated computer models. And those who thought that an old leftie senator from Vermont was doomed were wrong too. Those who thought he could win only the whitest states have a new set of hard facts to face. What just happened was a game-changer. Stunning. And all the talking heads and party bosses don’t have a clue what’s going on now. I can’t get there fast enough. I admit Sanders’ ideas FEEL far fetched- and THAT makes me angry. That I have become so jaded as to the possibility that my government could actually do something to improve the lives of U.S. citizens is a condemnation of what America stands for. To think that we have come to accept that half of our budget is spent on the military, that the oil and corn industries get huge taxpayer-funded subsidies, the rich have gamed the economic system so that they literally can’t fail, and all the other idiocy that our leaders keep doing. 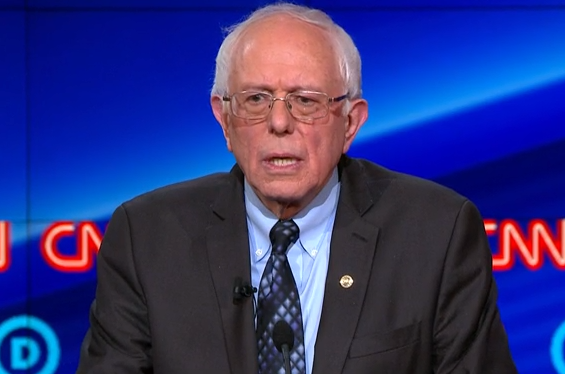 What Sanders hopes to accomplish SHOULD be the goal of this country. We have to swallow our pride and accept that we are not the best-run country on Earth, and take some lessons from others on what is best for our people. The struggle is real my friend, but so is the political revolution! As a Gen Xer I’m constantly haranguing my millennial co-workers and friends to get registered, get invested in the process, and vote for Bernie. It’s a shame many of them have never voted and apparently civics isn’t a requirement for high school graduation anymore. Thank goodness for crash course politics and government on YouTube!